Back in the 1920s a young sailor by the name of Norman “Sailor Jerry” Collins set up shop in Oahu, Hawaii and for 40 years tattooed his way into history. Sailor Jerry’s signature style with hints of Asian influence from his time with the Navy have come a long way since the pipe smoking, tattoo legend started inking sailors that came to port. Today Sailor Jerry merchandise can be found all over North America and abroad. Calgarians can gain a little insight on the man who said, “Good work ain’t cheap. 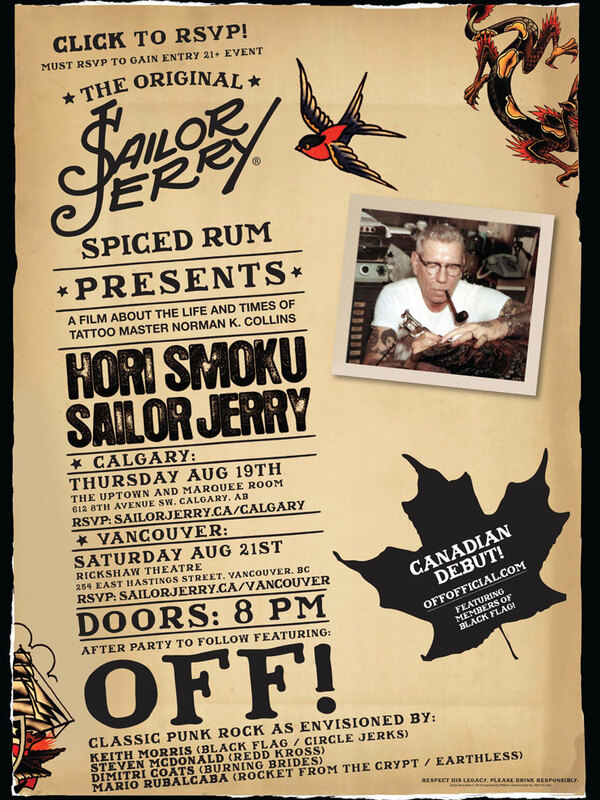 Cheap work ain’t good,” at a showing of the documentary Hori Smoku Sailor Jerry at the Uptown Theater Aug. 19. “We want to give people an opportunity to understand more about who Norman Collins was, and to some extent still is, in our minds,” said Iain Moodie, Sailor Jerry grand manager. The Sailor Jerry brand, Moodie explained, originally developed from a small group of people in Philidelphia who had the opportunity through the relationship they had with Collins’ estate to get artwork out to a large audience. “We started with some very select pieces, not super expensive, not trying to put rhinestones on it and sell [them] in super high-end shops and charge people a hundred bucks a t-shirt,” Moodie said. Being made in Philadelphia Sailor Jerry clothing is sweat shop free and with those first few t-shirts the brand took off and led to more products like hoodies and home-ware. And then with continued success Sailor Jerry turned to creating a spiced rum. “Everything that we do is about honouring the memory of Norman Collins and putting the spotlight on the talent and the very interesting life that he led, from there we started making the rum. We tried a few recipes…we landed on this one that we particularly like ourselves so tested [it] out on some friends and family they loved it,” Moodie said. Launched in the U.S, Moodie said that Sailor Jerry rum took off enough to launch it in the U.K then Canada and now they’re moving into Europe. Enter Hori Smoku Sailor Jerry. Directed by Erich Weiss, Hori Smoku takes a look at the history of tattooing in America. Calgary is the second stop for Hori Smoku in a cross-Canada tour that will see the documentary also hit up Vancouver on Aug. 21 then Halifax, Nova Scotia and Montreal later in the year. The Calgary show after party features the band OFF with Keith Morris, Steven McDonald, Dimitri Coats and Mario Rubalcaba. Next story Kelsey Does Calgary: Global Fest is here!